This team project was completed for a graduate course in Human-Computer Interaction at the Indiana University School of Informatics and Computing at IUPUI. My team decided to evaluate Microsoft SkyDrive (now called OneDrive), a cloud-based file and photo storage service with integrated Office web apps (Word, Excel, PowerPoint, OneNote) for creating, editing, viewing, and sharing files. I was directly involved in all aspects of this project. Each team member conducted an independent heuristic evaluation of SkyDrive, in order to identify usability issues. We inspected SkyDrive’s interface and interactions related to: navigation, file and folder management, file and photo sharing, and account management. We then shared and discussed our results to compile a final set of consolidated findings. Issue Inconsistent Menu: Options displayed in top menu bar change based on location selected in left navigation pane. Certain menu options are displayed (or not) depending on whether location has files (or folders) and whether any of these items are selected. This may be confusing to users who are used to static menu bars in other Microsoft Office applications. For the cognitive walkthrough, my team needed to determine the target user profiles for SkyDrive and then create scenarios for these users to perform relevant tasks using SkyDrive. Task Scenario 1: Ahmed, a college student, needs to create a new SkyDrive account, upload GMAT study preparation files, organize the files into folders, view the files, and take study notes using OneNote. Task Scenario 2: Tamika, a high school student, wants to upload a set of photos to SkyDrive, organize the photos by events, create a slideshow of photos, and share an email link to the slideshow with her friends. Task Scenario 3: Nandita, a project manager at a mid‐sized company, needs to create a SkyDrive account; create a new Word document and share it with a colleague; view the changes and comments entered in a Word document by a colleague and then modify the file permissions to prevent future changes by others; and upload an existing Excel spreadsheet, rename it, and edit it. Task Scenario 4: Jon, a sales representative and colleague of Nandita, needs to update his existing SkyDrive account to change his email, edit a Word document shared with him, notify the original sharer when the file has been edited, and delete a folder containing his personal files. Each team member conducted an independent cognitive walkthrough of SkyDrive by completing the task scenarios, in order to identify usability issues. We then shared and discussed our results to compile a final set of consolidated findings. Issue Unclear Navigation: After user has viewed photo, it is unclear how to navigate back to parent folder. User must click “View folder” link near top of right vertical menu. This may be overlooked by users who are accustomed to back navigation link being displayed in top left. Recommendation Navigation to return to parent folder should be more discoverable. For example, place link labeled “Back to Folder” (with back arrow icon) in upper menu bar next to SkyDrive logo. For the usability testing, my team created a testing script with a sequence of 8 tasks as part of a scenario in which the user is working with photos and documents related to a vacation. Each task was selected to focus on specific functions or features of SkyDrive that were identified as having usability issues during the heuristic evaluation or cognitive walkthrough. 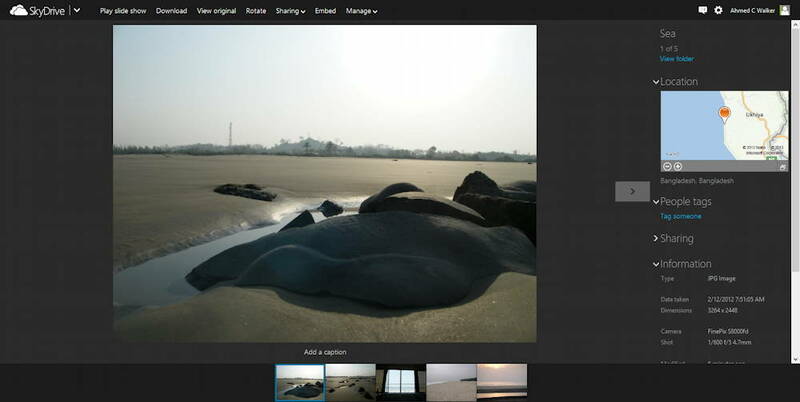 2 - View Photos You want to take a look at the vacation photos in the cloud drive. Briefly view a large image of each photo. When you are finished, go back to the main screen where you started. 6 - Delete File from SkyDrive You decide to remove the file called “My Next Vacation” from your cloud drive. 8 - Recover Deleted File You decide that you want to recover the file about your next vacation trip. After recovering the file, move the file out of the vacation folder, and place it into the main part of your cloud drive. Pre-Test: After signing a consent form for the testing session, we asked each participant to complete a pre-test survey with 3 multiple-choice items to assess their level of experience with SkyDrive (none had any prior experience), their level of experience with Google Drive (competing product), and their overall comfort with learning and using software. Usability Testing: We asked each participant to follow a Think Aloud protocol as they completed the tasks. One team member acted as the facilitator, while another team member recorded observation notes. We also recorded audio and video of each participant and their computer screen during the testing. Post-Test: We administered a post-test interview with 2 open-ended items to ask what the participant liked or disliked about using SkyDrive and to explain why. Then we had the participant complete the System Usability Scale (SUS) assessment based on their experience using SkyDrive. We selected the SUS assessment because it is a commonly-used, validated measure of overall usability. After each testing session, my team reviewed and discussed the observation notes. As necessary, we also reviewed the participant recording to confirm or clarify usability issues. We then compared the results from all participants to compile a final set of consolidated findings. Screen In Word web app, document opens in “read-only” view by default. User must select one of two options to edit document. Recommendation If user is document owner (or has editing privileges for a shared file), document should open in edit mode, instead of read-only view, to provide consistency with Word desktop application. Default mode for editing document should be to edit using Word web app. Offer option in File menu to download file (in order to edit offline using Word desktop application). My team compared our findings from our heuristic evaluation, cognitive walkthrough, and usability testing to create a final report summarizing the usability issues discovered within SkyDrive with our recommendations for potential fixes. The heuristic evaluation and cognitive walkthrough discovered 22 usability issues (severity: 6 low, 13 medium, 3 high). Most of the issues that occurred during usability testing had been previously identified, but there were 2 new issues discovered. In nearly all cases, users were still able to complete their tasks despite the usability issues — though this may be partly due to motivation to complete the scripted task, whereas in a natural context, users might have given up on the task. The users’ perception of SkyDrive’s usability varied widely as evidenced by the range in SUS scores (low = 27.5, high = 95). The average SUS score was 67. Generally, SUS scores of 70 or higher are considered acceptable. Heuristic evaluations can reveal a number of potential usability issues across the user interface, but it may not necessarily uncover the most critical issues affecting users. Cognitive walkthroughs focus more directly on user tasks, but they are limited by assumptions of how users will perceive and interact with the system. Usability testing is the most valid and effective method for discovering issues that impact target users of the system. Ideally, usability testing sessions would be incorporated into a design and development schedule on a periodic basis (e.g., bi-weekly or monthly) to test new features. Testing with as few as 3-5 participants can be sufficient to reveal most issues.